How are you preparing your children to successfully live on their own as young adults? If your kids are young, it may seem a long way off but time goes by amazingly fast! Before living on their own, they’ll need to learn everything from making meals to earning money and paying bills. Competence in these life skills develops with practice. Involving your kids in daily chores is one way to give them the practice they need. Children often enjoy helping out in the kitchen. Learning to make a meal is a fundamental skill. Is your child ready to take responsibility for a family meal or part of a meal? Young children may be able to make a simple breakfast and teenagers can typically handle cooking a dinner. When your kids are cooking something, there is a tricky balance between helping them and accidentally taking over too much. One way to allow your children more control is to tell them you are happy to help if they request your help with something. Then stay out of the way until they ask for your help. Do stay close by in case of an emergency like the oven fire we experienced when our daughter was making a very cheesy pizza! Doing chores develops your kids’ life skills. By the time children are 4-years-old, they are ready to be responsible for some household chores. While it takes more time to teach them how to do a chore than to simply do it yourself, your effort will pay off when they are able to do it on their own. You will be instilling in your kids the idea that being part of a family is helping out. A chore chart can be useful. Daily chores are part of their family responsibilities so you do not need to pay them to do their chores. However, you may offer to pay them for extra chores. One summer our then 12-year-old son learned to pressure wash the deck. He was happy to take on this new task especially since it involved getting wet and getting paid! My husband taught him how to use the pressure washer including all the safety information. It took many hours to get the job done but he stuck with it and we enjoyed a clean deck! A mom explained how she began teaching her 5-year-old twins how to do the laundry. The boys were so proud of knowing what buttons to push and how to do a load of laundry! 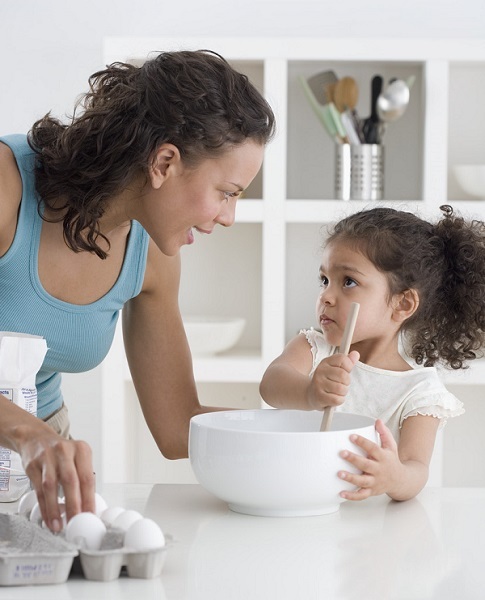 Mastering household skills builds your kids’ self-confidence. When your kids are growing up, you provide the money needed for food, clothing, shelter and other things. From your kids’ prospective, this money may seem to just flow. Until they have jobs, they may underestimate how difficult it is to earn money. Giving your kids an allowance is one way to help them learn about spending and saving money. Paying them for extra chores also gives them a way to figure out how to earn more money. Eventually your kids will need to earn money through a job. Many young adults are shocked by how much money is required to live on their own and how little some jobs pay. Reviewing something like the wage estimates from the U.S. Bureau of Labor Statistics can help them think through the work-money connection. There are plenty of college graduates who are shocked to find out that their expensive degrees do not translate into good paying jobs. For example, Evan graduated with a bachelor’s degree in philosophy. He was disappointed when his job search resulted in low paying employment. Although he loves philosophy, he found this interest did not translate into a good paying job. If your child can make enough money doing something they love, this is ideal. However, it’s far more likely your children will have jobs that involve doing things they aren’t particularly interest in doing – that’s why they get paid! Another shock for many young adults is just how expensive everything is! At some point it’s important for teens to know how much things like your TV, internet, cellphones, insurance and garbage pick-up cost each month. You may also want to have your teens pay for some of their own car insurance so they experience some of the expense of driving. Your kids may finance some of their expenses using credit cards. Before they get credit cards, you will be doing them a huge favor if you explain how interest and debt works. If you’re uncomfortable explaining it or think your kids will listen better to someone else, point them towards Khan Academy’s free videos on interest and debt. A dad said how shocked he was when his daughter told him she was paying only her credit card’s monthly minimum payment. She was unaware of the high interest that was accumulating on the rest of her debt. He regretted not explaining earlier the issues with carrying credit card balances. Paying back loans may not seem that difficult to your kids – that is until they try to do it. Kids entering college often underestimate how difficult college loans are to pay off once they graduate. Your guidance and experience can help them make better financial decisions. Will your kids be able to earn enough money to live on their own? Many young adults live with their parents because of the cost of housing. It may make financial sense for your kids to live with you while they save enough money to move out. If you are in this situation, it’s important to discuss the terms for living with you like household responsibilities, rent and length of time. You play a significant role in guiding your children to successfully start their own lives. When you give them opportunities to learn the skills they’ll need, you strengthen their wings so they can fly off and soar!